Buyers should be on high alert for any evidence of water in basement areas. Many inspectors use a moisture meter to determine active levels of water. In older homes, an oil tank scan is also something that should be completed if the owner or town does not have any records on file indicating the removal of one. If you are purchasing a very old home, you may want to invest in a camera inspection of the sewer line to see if any tree roots have compromised the system. Buyers should be on alert for visible water in the basement. The buyer should pay special attention to the landscaping around the house, the roof and the gutters. Does the water flow towards the foundation walls when it rains or away from the foundation? It is important that the area around the house slope away from the house. A home inspection is an excellent tool for a buyer to become familiar with the home they are purchasing. Most Inspectors are very thorough today. They are trained to see if there is any structural damage which is your first concern. Second would be if there is an underground Oil Tank, most banks today will want it removed, even if it is in use! The inspection is to protect & educate you so you are buying a sound house. Keep in mind the Seller however is not required to fix every cosmetic thing that you do not like. A homebuyer should have a checklist prepared ahead of time, which will be a valuable aide in focusing on the different areas of the house that the inspector will cover. Some of the areas include, building structure, roof, windows, doors, electrical, plumbing, heating/cooling systems, grounds – which include driveways, patios, pitch of the house, etc. Your Realtor should be able to provide useful resources to assist with this. I would first recommend my client have an ASHA Licensed Home Inspector. The purchaser and seller should be present at the inspection, as questions do arise. The prospective home buyer should follow the inspector around for questions on future maintenance items and home upkeep. The full written report of the inspection should be sent to their attorney and reviewed together. Aside for the usual things that buyers should look out for during inspection such as the age and condition of the roof, furnace, hot water heater, appliances, and such. Buyers should discuss with the inspector what to do to upkeep the house. How often to clean out the gutters? When to change filters? Winterizing, and others. As a homeowner it is important to know when to spend money to keep up with the everyday wear and tear of a home. Homebuyer wants to make sure to select a reliable local inspector who is very familiar with the area so he won’t miss any important detail. For example to be aware of a wet area or homes built on a natural stream. Don’t be scared of termites trace, almost every house in NJ had termites, currently have, or will have…. It’s treatable and the homeowner is responsible to take care of it and provide the warranty. Another element is the radon test when the result is above normal (4pCi/L or higher) especially in New Construction. A good home inspection addresses what you can’t see as well as what you can. A prime example is the underground oil tank. Even when buying a gas-heated home, you want to know if there is a tank somewhere underground on the property. Should your home inspector see evidence of an underground tank, your next step is then to have an environmental service company inspect and test to make sure that the tank was abandoned properly and that there is no leakage. In fact, even if the inspector doesn’t see any evidence of a tank, it would still be prudent to have a tank inspector scan and document that there is no underground tank or residual environmental issue. That documentation will also prove very valuable in any future negotiations about the property. 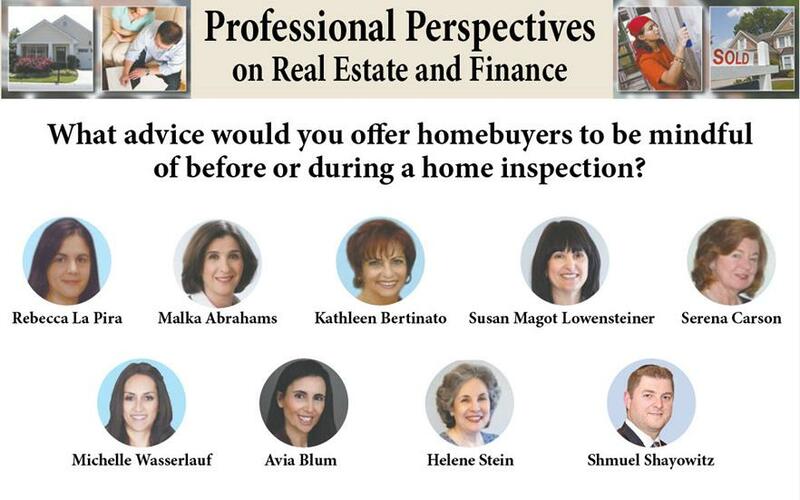 My thanks to Rebecca, Malka, Kathleen, Susan, Serena, Michelle, Avia, and Helene for their great insight on this topic. Home Inspections have evolved tremendously over the years and working with a competent professional in advance of a purchase can save a home buyer a tremendous amount of aggravation, surprise and disappointment in the weeks and months to come after closing. Skimping on the quality of a home inspector never proves favorable for a buyer in the long run. Please make sure to always work with our Real Estate and Mortgage Professionals to provide you with all the resources and contacts that you will need to ensure a comprehensive and smooth transaction from start-to-finish.